Our second stay in Cockle Cottage and our sixth visit to Roundhouse Barns. Just as perfect as previously. Barbara and Mark have thought of everything. 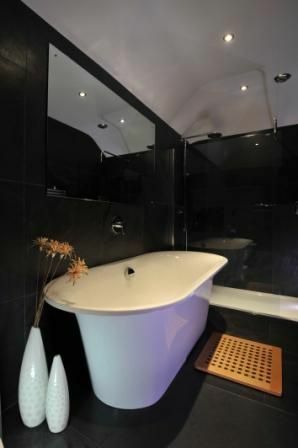 Amazingly comfortable bed, luxury shower/bathroom, well fitted kitchen, relaxing lounge and such an efficient central heating system (perfect for when we visited at the beginning of March). Will certainly visit again. The cottage was recommended by my friend who stayed in November 2018. Although my "Cornish" hubby was born a few miles away from "The Roseland" we have never visited. We were amazed by the unspoilt beauty of this small part of God's Country! Although early January we had no rain or wind for our two breathtaking South West Coastal Path walks. We enjoyed wonderful service, delicious meals, The Rosalind Inn is a must! and walks along rugged beaches, saw seals and plenty of birds. The cottage is so spacious and everything you need is there. 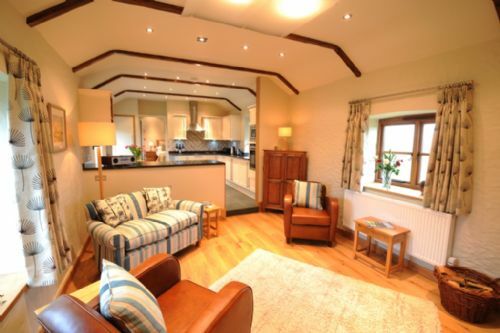 A huge comfortable bed, a relaxing roll top bath, plenty of films to enjoy by the log burner. This small collection of cottages is quiet and delightful in everyway, you will not be disappointed by what Barbara and Mark have created here. The situation makes visiting many parts of Cornwall easy and you must use the King Harry Ferry it takes miles of your journey to Truro and beyond. Visit soon and you will love it too. Thank you for making our winter break so memorable. We stayed at Cockle Cottage in November 2018. Upon arrival, the cottage was warm and welcoming with two scones jam and cream waiting for us. Two complimentary pasty's were in the freezer. The cottage is well equipped with dishwasher, fridge/freezer, washing machine and plenty of cutlery, glasses, plates and dishes etc. All of an excellent standard. The cottage overlooks an enclosed courtyard. A washing line is available. Overall a superb, quiet and restful place to stay. Roundhouse Barns is off the beaten track and a car is needed to visit most nearby attractions, pubs and restaurants. Walks are available from the door and even St Mawes can be reached on foot if you are feeling fit. As a footnote, the weather was fine and dry during our stay. We booked this cottage last minute following a change of plan for our holidays. We have stayed in many self catering cottages, apartments and villas over the years and can safely say without hesitation this is the best property we have stayed in. the cleanliness and quality of finish in the property is faultless and frankly is pristine, not that we were finding fault but honestly there was nothing to fault! Barbara and Mark very welcoming and we were made to feel right at home straight away. location is ideal for exploring Cornwall. We managed to get to Lizard, Lands End, Padstow, St Ives, Newquay, Falmouth all quite easily from the cottage. We wouldn't hesitate to recommend The Barns. There's no point in renting a property that doesn't match or exceed the standards you have at home and any of the three barns will not disappoint. There were some nice walks from the cottage but we had to use our car more than we would have liked. You couldn't walk to a restaurant. We liked the open plan design of Cockle Cottage but felt the bedroom was rather small - being dominated by the king sized bed. However the bed was very comfortable. The kitchen was excellent with high quality fittings. This is a beautiful cottage set in a quiet and very peaceful location yet well placed for exploring the Roseland Peninsula. We booked the cottage in order to walk local sections of the South West coastal path and it was ideal for this purpose. This is our 3rd stay at Roundhouse Barns and first time in Cockle Cottage. We knew the standard of the cottage and it's cleanliness would be of the highest standard and we were not disappointed. Barbara and Mark know what discerning guests want and never fail to ensure it's provided. 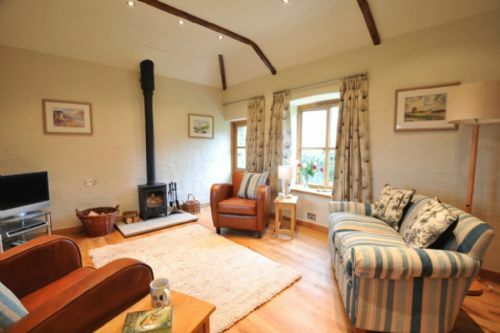 A beautiful cottage in a super location and suitable for a holiday at any time of the year. Online booking system and communications with Barbara and Mark are simple and very efficient. The stay was beautiful as was the cottage, it was a little isolated in regards to walking to shops and pubs etc. Thank you very much for your review. We're sorry that you found us a bit isolated for pubs and shops. We do very much position our cottages as peaceful and tranquil, nestled in an area of Outstanding Natural Beauty. We believe that the google map on our website accurately reflects where we are located. We are a short car ride (4 miles) from the shops and restaurants in St Mawes and Portscatho. Thank you for also saying that our cottage was beautiful. We were a bit disappointed that you only judge us 2/5 for value for money for what is one of Cornwall's finest self catering cottages for couples and is graded by the Quality Inspectors as a 5 star Gold award winning cottage. We spent al very, very loveley week at Rondhouse Barns. The cottage was outstanding with very good equipement. You have all what you need, also for longer stays. The open kitchen with the great living room by side is very confortable, the bathroom is like a "designer-room". The location is very quiet, only the cattles could wake up you in the morning, if they have a look in your sleeping room, what a nice start in the day. The Roseland peninsula is a good region for your discoverys. We love to come "home" to Roundhouse Barns after our walks, dinings and excursions. Thank - you Uwe and Ute we are so glad you had a lovely holiday in Cockle Cottage. We hope to see you again. plus. We were very fortunate with the weather and the countryside was beautiful.with an abundance of bluebells and wild flowers. The cottage is well situated for all parts of Cornwall but a car is an essential. Roundhouse Barns offer a wonderful holiday if you want to get to know the Roseland peninsula and the Fal Estuary. There are plenty of good walks from the cottages without having to use your car and there are other walks around St Anthony Head and Pendower Beach which are just a short drive away. Falmouth, using the ferry from St Mawes, and Truro, by road, are within easy reach and both are very nice places to visit. We have returned to Roundhouse Barns regularly over the past ten or so years and we always receive the same warm welcome from Barbara and Mark who keep their lovely cottages in excellent condition. Lovely cottage and peaceful place, and a lot of places to visit. Very comfortable and warm cottage , owners very helpful and friendly, would definitely recommended this cottage. Lovely to see you again and hope to catch up again soon. Glad you enjoyed the log burner - it certainly adds something special to Cockle Cottage. An extremely comfortable and very well appointed self contained cottage in a most peaceful and picturesque location in a wonderful area of Britain, so what’s not to love? The friendly owners are at hand if required, but rarely are and are certainly not intrusive and always provide a warm welcome. The log burner is a welcome bonus during winter breaks although the more than competent central heating makes it an added feature, not a necessity. Attractions abound in the area, from walks along the Fal estuary on the doorstep and the southwest coastal path nearby, to everything Cornwall has to offer its visitors. Whatever your requirements, Roundhouse Barns provides a most comfortable base from which to explore the area and to return to for a relaxing evening. We are very sorry that this guest had a fall during her stay in Cockle Cottage. We do not recommend Cockle Cottage for guests with mobility issues as there are a number of small internal steps in the cottage. Our Access statement, which is available on our website makes this very clear. This particular guest needed two sticks and assistance to walk down steps. Our other two cottages The Dairy and The Carthouse are all on one level and much better suited to guests with mobility issues. We are always happy to discuss the cottages and their suitability for guests and suggest that anyone concerned about a cottages' suitability contact us to discuss their personal requirements before they book. Thus was a return visit to Roundhouse Barns and Cockle Cottage didn't disappoint. All three cottages are delightful, very well equipped, comfortable and spotlessly clean. We wouldn't hesitate to recommend them. Cockle Cottage has the benefit of your very own 'alarm clock' from the cows mooing in the adjacent field! Book early to avoid missing out. We had a wonderful stay in Cockle Cottage. From the moment we arrived our host was very welcoming and made us feel right at home. 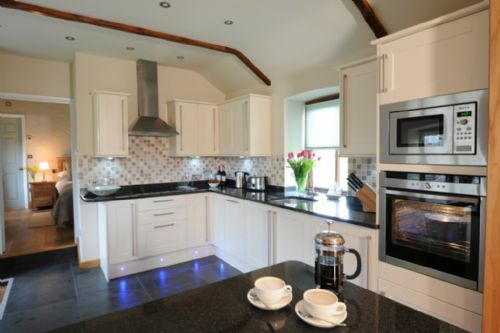 The Cottage was extremely well furnished with a beautiful kitchen. The bed was so comfortable I asked our host where she purchased it, and the linen was the best quality I was impressed! The area is very quiet and close enough to St Mawes if you need supplies. There are many pubs a short drive away if you fancy a pub meal. We were given a warm welcome by Mark, having arrived very late to the cottage due to car and traffic problems. The rest of the week had varied weather and the cottage was a lovely haven to return to, whatever the weather. The log burner and selection of dvds came into their own on the rainy evenings, whilst the patio was a sun trap on better days. Mark and Barbara were excellent hosts. Spotlessly clean, beautifully furnished, well equipped, peace and quiet in a lovely setting, a credit to Barbara and Mark. Cockle Cottage is a delight in all respects. The attention to detail is rarely seen in other holiday lettings and the accommodation is extremely comfortable. The brand new king size bed, the luxury bath, the walk in shower and the wood burner in the light and airy sitting room, were all much appreciated. We'll certainly be returning! An extremely well appointed and equipped cottage. This rates as about the best cottage we have stayed in quiet and peaceful with top notch appliances, comfortable bed and great bathroom. Some lovely touches from Barbara and Mark - cream tea, fresh flowers , soap and bath salts. Highly recommended. We stayed in Cockle Cottage at the end of December 2016 for one week as our "mini moon" after getting married on 27th December. It was fantastic. We were greeted by Barbara who showed us around and explained how to use various bits and bobs such as the log burner. She also gave us handy directions into St.Mawes (an easy 5 mile drive from the cottage) so that we could get some food upon our arrival. The cottage itself is perfect, with all the appliances and more that you could possibly require. The bath is to die for and the bed is quite possibly one of the comfiest beds we've ever slept in. The location of the cottage is also fantastic, close enough to the local town of St Mawes, and only a 25 minute drive to the Cathedral City of Truro where we ate out a couple of times. The location is also easy enough that you can be in St.Ives in less than an hour and we enjoyed a day out wondering around and trying to locate the best Cornish Pasties! It's the little touches that made our stay just perfect. A bottle of champagne was left for us, along with a box of celebrations, mince pies and home made scones and jam. Party poppers and crackers were also laid out on the table to help us see in the New Year along with a handwritten card from Barbara and Mark. We found that we enjoyed the peace and quiet of the cottage so much that we didn't even venture out for a couple of days, quite content in front of the log burner reading books (plenty available in the cottage) and watching films (also a good selection in the cottage). I stayed in Cockle Cottage for 4 nights to celebrate a 40th birthday. The cottage itself has been modernised to a very high standard and everything about it is of very good quality and everything worked as it should. I especially liked the quality of the kitchen knives that actually cut things and the induction hob. An abundant supply of fire wood for the log burner was very much appreciated and the large walk in shower and modern roll top type bath were fantastic. The location on The Roseland Peninsula is excellent. We very much like taking breaks in self catering accommodation with family, close friends and as a couple. Cockle Cottage certainly fulfilled our expectations for our break together last week. The situation was perfect to explore a part of Cornwall we did not know so well. On arrival we were greeted by Barbara and shown around our home for a few days, first impressions were excellent and we knew we had chosen a good place to stay. We were not disappointed, much thought has gone into providing a well equipped and comfortable property. Often there are things missing or not quite right but this was not the case at Cockle Cottage, we would definitely recommend as a break for a couple that just want to get away to relax and explore a beautiful area. A lovely cottage in an area of Cornwall we had not visited before and we were not disappointed. The cottage was a real home from home with everything you might need. The cream tea on arrival was very much appreciated and a nice touch. Mark and Barbara, the owners were the perfect hosts - very welcoming and there if you needed anything. A great area for walking with some lovely village pubs serving delicious food. We would not hesitate to return again. We love Cornwall and try to visit for at least a week every year, we have been now 3 times to Roundhouse Barns and will return, great location, lovely property and owners. If you are looking for a cottage for two people that is maintained to a very high standard with all the facilities that you could ask for choose one of the three at Roundhouse Barns. You will receive a very warm welcome from the owners, Barbara and Mark, who are always available if needed. Local amenities at St Mawes are within 15 minutes drive and there are plenty of walking routes from the cottages with paths overlooking the Fal Estuary. Other locations on the south coast, like Truro, Falmouth via the St Mawes Ferry, the Eden Project and Heligan Gardens are easy to get to, so there is plenty to do and a week's stay passes all too quickly. Like many other visitors to Roundhouse Barns we have stayed there several times and will go again, which speaks for itself. We arrived to a warm welcome from Barbara and Barney, the dog, who we think must have a very happy life making new friends every week. We loved his visits to the cottage in the morning and the fact he would knock on the door with his paw to tell us he was there! Barbara took us to the cottage, gave us a tour and then left us to enjoy our home baked scones. The cottage is delightful. Light and airy by day and warm and cosy by night, transformed by the log burner. A large basket of logs was there when we arrived and plenty more available throughout our stay. The kitchen is well equipped and we liked the fact that the living space was open plan and so we could cook and chat and listen to music ... There is a good quality iPod dock and radio. The bedroom is compact but has plenty of stargaze space and the bed was comfy and had a lovely fluffy quilt. The cottages are well situated as a base for exploring the Roseland and we enjoyed lots of lovey coastal walks, It was lovely to walk after breakfast, return for a late liunch, chill for a while and the be able to walk directly from the cottage to Turnaware beach about a mile or so down the lane, which we did late afternoon nearly every day. We also walked to Messack Point and had it not begun to rain heavily we could have carried on to St Just in Roseland and St Mawes. ... This is a nice walk as we have done this when we previously visited the area. We had an online shop and then used the butcher and general stores in Portscatho. The local farm shop was closed at this time of year but we have used it before and it is very good, We were sad not to source fish locally as.a result because the fishmonger in St Mawes was also closed during our stay. There is a delicatessen and Co- op supermarket in St Mawes, There is an allotment at the property and guest are welcome to pick their own veg ... We enjoyed some tasty leeks! We will certainly return. We sneaked a peak at he other cottages and they all look lovely. We would probably choose Cockle again because we love the log burner! We received a lovely welcome on our arrival at Cockle Cottage and were introduced to the workings of all the amenities. There were a number of thoughtful touches which were very nice to receive, such as, a traditional cream tea, two vases of fresh flowers and complimentary toiletries. The condition of the cottage was excellent and it is furnished to the highest standards. We were most comfortable for the duration of our stay. The locallity provides plenty of interesting gardens and places to visit and the coastal scenery and walks are excellent. There are some very good restaurants and pubs within a short distance of the cottage providing quality food based on locally-sourced produce. We shall do our best to return soon. Another wonderful stay in Cockle Cottage. Barbara and Mark have thought of everything to make the accommodation so exceptional. Mark's homemade scones on arrival are divine. Perfect setting for a peaceful stay away from the manic rush and tumble everywhere else. The cottage is furnished with everything required or desirable for a totally relaxing break and surrounded by fantastic countryside to accommodate every need. My wife and I have stayed at Roundhouse Barns 11 or 12 times now and Cockle Cottage is our personal favourite. It is fitted out to a very high luxury standard (as all the properties are) and is always warm and cosy. Cockle Cottage is a perfect Self Catering property, is very well equipped and is lovely and quiet away from the hustle and bustle. Having stayed at a lot of other cottages that are so say 'Premier', none of them have ever come close to the standards set at Roundhouse Barns. The hosts, Mark and Barbara, are very friendly and a warm welcome always awaits us. On reflection, if I rate it too highly, more people will fall in love with it and make booking for next time more restrictive! Needless to say, we have already booked for another ten days in twelve months time. Highly recommended by a discerning International traveller. A lovely, very well equipped and maintained place to stay. We stayed in Cockle Cottage for 9 nights and despite a gruelling 9 hour drive down it was a great feeling to walk through the cottage front door again. I cannot remember how many times we stayed in this cottage, what I can remember is the quality of the cottage and the constant reminder of attention to detail that Barbara and Mark have gone to. The cottage is for couples and is an adults only holiday, which lends itself to peace and tranquility in the grounds. Mr and Mrs Sadler are the perfect hosts and nothing is to trivial to help you have a comfortable stay and after staying here quite often I can now say without prejudice that it's a great cottage and we will keep coming back for more, if only for the log fire. The moment our host welcomed us we knew we were going to enjoy our holiday. Everything was provided for and more. Cannot wait to return to enjoy the tranquility. We absolutely loved our stay at Cockle Cottage. Barbara and Mark were exceedingly kind and helpful before we arrived and during our stay. The cottage was PERFECT and the location SUPERB!! We had the most excellent stay at Roundhouse Barns. We had the most wonderful stay. The cottages were superb. The location excellent. The dogs superb. Not enough letters for what I would like to say. A very well equipped barn in a peaceful location & the perfect base for exploring the stunning Roseland Peninsula. The furnishings are of a high standard & the interior tastefully & thoughtfully styled. The owners are very welcoming & helpful & have provided plenty of local information to help you make the most of your stay. There are many enjoyable walks in the area, & so many wonderful places to visit, but should you be unlucky with the weather, the barn is very cosy & comfortable. A wonderful cosy cottage in a glorious location. I stayed in Cockle Cottage for 3 nights end Feb/early March. The cottage is perfect, tastfully decorated, well equipped, cosy and peaceful! Lots of little extra's for cosy nights in - board games, large TV and DVD selection. I would highly recommend staying in Cockle Cottage. Thoroughly enjoyable stay at Cockle Cottage. We would certainly return to Cockle Cottage and would recommend it to all our friends. The cottage was well equipped and immaculate in all respects. We found the log burner a cosey addition on our return each evening with a plentiful supply of logs available. 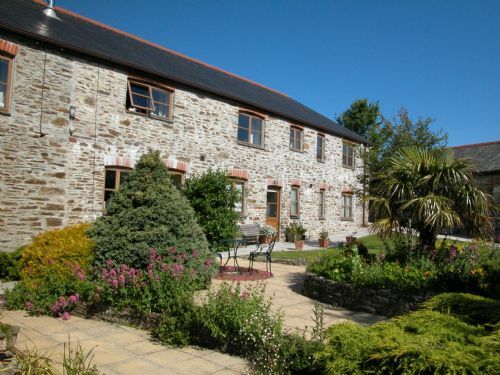 It's location on the beautiful Roseland peninsula is ideal for a family holiday. The only slight downside is the distance to drive to other parts of Cornwall, due to its position on the peninsula, although this can be overcome by using the relatively expensive King Harry Ferry. We had a wonderful week at this lovely cottage. It is definitely 5 star bordering on 6 star. It is equipped with everything you could possibly wish for and all to a first class standard. The bathroom was very luxurious and the kitchen has every mos con. The wood burner was brilliant and made this a really cosy cottage. Barbara & Mark, the owners, were very helpful and friendly. We would definitely recommend this cottage and would consider returning to it ourselves. Angela & Geoff, Swindon, Wilts. What a fantastic 7 day stay in this cottage, 2 days after Christmas! This place was as good as the brochure photos for once and lived up to the description. Believe you me my wife and I have stayed in a few cottages in Cornwall and this was by far the best from the luxury bathroom and bedroom, to a stunning kitchen, I cannot praise the owners enough. Icing on the cake was the weather......Stunning. Its not cheap, but you can book with confidence.